This beautiful and unique piece of music seems typical of the last Schubert year in that it is dominated by thoughts of Beethoven: in writing it Schubert was both paying homage to the memory of his great musical forbear, and establishing his right to be considered Beethoven’s natural, and worthy, successor. This view of the song’s significance is a fairly recent one; Capell said that it was written by ‘the copious Schubert of legend’ while judging its sentiment ‘really only formal’. But a later generation of commentators (Rufus Hallmark and Christopher Gibbs chief among them) have seen in this formality Schubert’s conscious attempt to mirror the manner, and honour the spirit, of the older master. As we shall see later in this commentary, Auf dem Strom contains a musical quotation from the ‘Eroica’ Symphony, a work which Beethoven composed (according to the title page of the first edition) ‘per festigiare il Souvenire di un grand’ Uomo’. 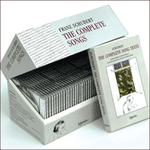 It is apt that in writing Auf dem Strom Schubert was, in turn, also paying tribute to the memory of a great man. It is fairly certain that Schubert began work on this pièce d’occasion only once he had decided to hold his public concert, the first and only event of this kind in his life, on the first anniversary of Beethoven’s death – March 26, 1828. Rellstab could not have written this text with a tribute to Beethoven in mind – in fact it is almost certain that he had hoped that Beethoven himself would set it to music; but the use to which Schubert put these words is a good illustration of his ability to evaluate the myriad hidden messages in any poem. He saw in an instant how it was ideally suited to commemorate the great composer. It was a poem of farewell (and, by implication, life’s final parting) where the narrator is cut off from other human contact (this splendid isolation immediately suggests the older composer) as much in life as in death. The singer is unable to hear songs from the distant shore (this suggests the struggle of an involuntary loneliness, as if the narrator were deaf perhaps), and the beloved is an intense but distant memory. The course of the love affair hinted at in the poem seems as frustrated and unfulfilled as Beethoven’s contemporaries knew his own amatory life to have been, something which fits in with the composer’s most famous work for voice and piano, the cycle An die ferne Geliebte. And the sight of the stars at the end of the poem ‘in the sacred distance’ calls for musical sublimity in the manner of one of Schubert’s favourite songs by Beethoven, the star-lit Abendlied unterm gestirntem Himmel. In short, the work’s scenario, which seems pretentious, over-dramatised and unlikely for a figure like Rellstab in narrative mode, takes on a completely different resonance if one imagines it is Beethoven himself singing as he sets sail from life’s shore. And if Beethoven had set these words to music, as perhaps he intended, he himself would have been the narrator! 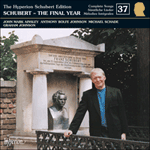 In Auf dem Strom Schubert has relinquished the subjectivity of the poem’s ‘ich’ in honour of the great man; and of course we are moved by the fact that we know that his own leave-taking was only some eight months away. A less worthy (or at least less wordy) composer than Schubert might have been tempted to vaunt all these connections and capitalise on them. Perhaps Schubert was too modest; he might have thought he would have been judged audacious to take up the task of honouring Beethoven in this way. But it would also have been typical of him to have made, in a flash, all these links between the poem and its relevance to Beethoven simply for his own edification and inspiration. It was enough for Schubert to know that he was paying a tribute to the great master without being fulsome about it, and without broadcasting the idea to others. (This is typical of Schubert’s attitude to musical homage via quotation throughout his life; the musical sleuth can uncover many references to Mozart, Gluck and other composers but they go into the fabric of Schubert’s music without comment – from the composer at least – and often unnoticed). Thus Auf dem Strom stands or falls as a piece by Schubert, not as the Beethovenian stylisation which, at least in part, it is. Of course there are a number of important and typical elements which are quintessentially Schubertian, the chief of which is the movement of water, in this case a current of varying strengths and intensities. This is not quite the last of Schubert’s water songs (Liebesbotschaft has that honour) but the liquid triplets which dominate Auf dem Strom propel the departing barque as it makes its way downstream, carrying the narrator with it. In the third song of Beethoven’s An die ferne Geliebte cycle (‘Leichte Segler in den Höhen, und du Bächlein klein und schmal’) there is also water music in triplets, but in Auf dem Strom we are reminded more of the alla breve movement of Schubert’s Mayrhofer setting Fahrt zum Hades where the journey is one of death and anguished farewell. Once the moto perpetuo triplets of both Fahrt zum Hades and Auf dem Strom are set in motion (in both cases underpinned by longer and resonant bass notes) the musical current carries each piece ineluctably to its final destination. The relentless nature of the journey is reflected by Rellstab’s ‘Schon wird von des Stromes Wogen / Rasch der Nachen fortgezogen’ (verse 1) and ‘mit unerflehter Schnelle’ (verse 2). These words are an indication, by the way, that this piece should move forward at two-in-a-bar and not at the sluggish crawl of many a performance. Also in the second strophe there is the key passage ‘Hoffnungsleer verhallt die Klage / Um das schöne Heimatland / Wo ich ihre Liebe fand’ which must have reminded Schubert instantly of that theme of separated lovers, and the link to An die ferne Geliebte. The presence of the horn on the concert’s list of artists was no doubt partly to do with Schubert’s need to have both novelty and celebrity on the bill in order to sell tickets. The distinguished horn-player Josef Lewy was available for the concert, probably as a return favour for Schubert’s contribution to his benefit concert at the Kärntnertortheater on 22 April 1827 for which the Nachtgesang im Walde D913 (for male voice quartet accompanied by four horns) was composed. (This had included the participation of Josef Lewy’s brother Eduard, also a horn-player.) But there were also artistic reasons for building the horn into the programme: the sound of the instrument had long been held to be symbolic of heroism and strength of purpose (as in the archetypal aspect of the brave hunter) as well as heroic death (compare Schubert’s own use of horn sounds in Die liebe Farbe from Die schöne Müllerin). There is something about the sound of the horn at the opening of this piece which immediately sets a mood that is mournfully elegiac – noble and distant, as if other-worldly; this seems suitable to honour the memory of a great man, a warrior in his own way. And the instrumental component of the work seems also appropriate for Beethoven: the work is vocal but not immediately so – the first thing we hear is a beautiful instrumental seventeen-bar introduction which reminds us that the older composer was a noted writer for the horn, both in symphonic and chamber music (in the Wind Quintet Op 16, the Horn Sonata Op 17, the Septet Op 20). We may also wonder whether Schubert had had access to Beethoven’s complete Handel edition by this time and noticed – particularly in the operas – how that composer was a master of writing arias with horn obbligato. In sheerly practical terms, amateur horn-players would find this music too difficult, thus limiting the number of times Auf dem Strom might receive a performance. This probably accounts for the fact that there is a version for obbligato cello – first performed in 1829 – which was published alongside the horn version. Whether this alternative had Schubert’s blessing, or whether it was simply the publisher’s idea, is not known. In this way many strands of thought and appropriateness converge as one in Auf dem Strom. In the most obvious way the work stands next to Der Hirt auf dem Felsen from later in the same year (perhaps Schubert would have gone on to compose a whole series of songs for voice and obbligato instruments) but they are different works both in mood and intention. The cantata for voice and clarinet written for the famous soprano Anna Milder was written more or less as a result of a commission (without fee) from a great singer; it is a celebration of vocal virtuosity and picturesque effect, and it has won a place in the heart of all Schubertians. Auf dem Strom is no less difficult to sing. It was conceived for the tenor Ludwig Titze who was well-known for his ability in the heights – indeed the work’s tessitura has probably been a factor in limiting the number of performances we hear. (This type of writing seems to mirror Beethoven’s own merciless challenges to the singing voice.) The horn-writing is also extremely demanding; many a player feels exposed and challenged, particularly on the natural (as opposed to the valved) horn, and the ensemble with the voice requires a fine ear and musicianship. But Auf dem Strom does not sound like a virtuoso piece because its purpose was too serious for mere display. In this work Schubert was wrestling with his own demons – one may almost say exorcising the ghost of Beethoven as he provided music for that great soul’s crossing from one side to the other. As we shall see, there is much in Schubert’s music from 1828 which seems to honour the older composer, and its purpose was to mark his passing downstream in a way that would eventually leave Schubert in possession not only of the shoreline, but in command of the heights. We have already spoken of the seventeen-bar introduction. The piano accompaniment is framed in simple triplets all the better to support the horn solo as if it were a bel canto aria. This begins with a simple fragment of melody, two bars long with a jump of a sixth, which is then capped by a sequence incorporating a jump of a seventh; a third sequence, higher still, is supported by a sudden change from the E major of the home key to a 6-4 of G sharp minor brought about by the downward slip of a semitone in the bass from E to D sharp. So does the Schubertian magic begin to take hold. That D sharp changes from a second inversion of G sharp minor to the tonic of the unlikely key of D sharp major for a bar as the horn hovers on a semibreve A sharp; this slips down, in melting fashion, to a semibreve A natural supported by piano triplets on a B major chord and this B7 leads us back to E major. But in this tiny excursion the mood for the pain of parting, and of strangely unfulfilled longing, has been established. From now on (in the introduction at least) the piano’s journeys are less adventurous (although there is a superbly placed but fleeting move to the subdominant – a momentary shift, but one which contributes hugely to the mood of resigned pathos). The remainder of the horn-writing in this introduction is also in more Classical style although galant groups of ascending semiquavers and a trill show that Schubert was not entirely unaware of the horn-player’s amour propre. Rellstab’s poem consists of five eight-line strophes, and each of these is separated from its neighbours by an interlude for horn and piano. The opening vocal line announces a melody, one of two which will be the main threads binding the various parts of the work together. It is a tune of which Beethoven himself might have been proud – gallant and a bit old-fashioned, built partly on a simple tonic-key arpeggio, and yet instantly memorable. This melody uses the first two lines of the poem; the next two lines (ending with ‘wende!’) are set to almost the identical melody, changing direction only at the cadence where the music veers into the dominant. It is notable that the voice and horn, with the breathing space of a suggestion of canonic imitation, are immediately entwined in masterful fashion – one is seldom aware of any balance problems between them in performances of this work. As soon as the boat pulls away from its moorings (at ‘Schon wird von des Stromes Wogen’) the key changes to E minor and the triplets become more restless; the insistent left-hand B naturals followed by split octave Bs in the right hand suggest the pull of a strong current. At ‘doch den tränendunklen Blick’ it seems as if the music is headed for G major but an attempt at a cadence in this key is thwarted at the word ‘zurück’ where the sudden intrusion of a left-hand D sharp leads us back to the E major of the home key – a superb musical analogue for the pull of the narrator’s longing to return from whence he came. There is now a ten-bar interlude which re-uses the material of the opening with the piano, rather than the horn, announcing the fragment of melody with the leaping sixth. There is the same beautiful change from G sharp minor to the major-key version of its dominant (D sharp major) but this time Schubert steers the music, with a deft hand on the tiller, into C sharp minor. Now we can no longer doubt that the composer sees in these words a metaphor for death, signifying much more than a tourist’s journey. And why? Because, as Rufus Hallmark first pointed out in 1976, the melody beginning with the words ‘Und so trägt mich denn die Welle’ is taken, almost note for note, from the Marcia funebre of the ‘Eroica’ Symphony. As the tenor voice sounds an octave lower than written, even the tessitura is the same as the violins’ announcement of the theme at the opening of that movement. (When the work is performed in E flat major – as it is sometimes to spare the singer – even the pitches are exactly the same as Beethoven’s.) After these four bars there is an eloquent and pulsating two-bar interlude for horn and piano followed by a sweeping eight-bar phrase (beginning ‘Ach, schon ist die Flur verschwunden’) which, at the repeat of the words ‘wo ich selig Sie gefunden’, moves momentarily into C sharp major, a fine example of Schubert’s use of major-key tonality to limn the nostalgia of vanished happiness (this type of change is a regular feature of Winterreise). The next four lines of this strophe (from ‘Ewig hin, ihr Wonnetage!’) are set to an exact repeat of the preceding fourteen bars – so we hear that ‘Eroica’ quote once again; the one difference is the shared trill at the end – a delectable touch denoting trembling excitement – between voice and horn on ‘Liebe fand’, the last words of the strophe. The interlude (eleven bars) uses the music that is now becoming familiar as linking material – an interchange of the same fragments of melody between horn and piano. It begins in C sharp minor but shifts back into E major in order to set up a return of the melody we have heard in strophe 1. Strophe 3 is not an exact repetition of the first (Schubert is too subtle a word-setter for that at this stage of the game) but it is very similar. One of the differences is an appropriately sensual and decorative setting of the words for the strophe’s fifth line (‘In der Laube dort zu weilen’) where Rellstab departs from his usual division of the eight-line strophe into two groups of four lines. Another difference is that the composer, at the equivalent passage in the first strophe, had pulled the music back (at the word ‘zurück’) from a modulation into G major, but here this change of key, previously thwarted, is allowed to happen. The effect of this opening up of the harmonic landscape masterfully suggests larger ocean vistas, and strikes notes of both triumphant release and terror. For the first time the vocal line is marked ‘fortissimo’. This reckless confidence quickly cedes, during the six bar interlude, to greater doubt as the music feels its way, with typically Schubertian ingenuity, into C sharp minor. The fourth verse is the dramatic centre of the piece, an outburst of feeling accompanied by unceasing triplets. Once again the theme is that of the ‘Eroica’ Marcia funebre, but this is now a water-borne catafalque moving swiftly to its last resting-place. The words refer to dread and the dark wilderness, as well as a storm at sea, and it is no surprise that it is this section of the piece which is most reminiscent of Fahrt zum Hades. If the general shape and direction of the music are the same as that for strophe 2, there are many changes of detail. For example, the expressive instrumental interlude which had been placed between lines 2 and 3 of that verse is now excised in the interests of turning the screw of drama more tightly; and the setting of ‘O, wie fast mich zitternd Grauen!’ is tailor-made for those words alone – the horn is made to plunge to a lower tessitura than ever before in this piece which is usually more noted for its heights than its depths. This feature is retained (at ‘durch das grau gehob’ne Meer!’) when this music for the strophe’s first four lines is repeated for the next four; thus we hear the Beethoven ‘Eroica’ theme for the fourth time, set to the words ‘Wehmutstränen sanft zu bringen, / Kann kein Lied vom Ufer dringen’. Despite the differences of detail dictated by new verbal imagery, the music for strophes 1, 3 and 5, and that for strophes 2 and 4 is broadly speaking the same in terms of overall shape and design. We have noticed this interleaving binary structure before – in such a long song as Schiffers Scheidelied for example, a work incidentally not unrelated in subject matter to Auf dem Strom. The interlude between strophes 4 and 5 is eleven bars long, and in essence we have heard the same music right at the beginning of the work. Its purpose here is to calm the triplet-dominated turbulence as the narrator’s fear yields to acceptance and a philosophical view of his new state. Now on the open sea, he has lost sight of land and looks up to the stars for consolation. Thus might Schubert have imagined Beethoven contemplating his own immortality after the ravages of his unhappy life, as if about to be elevated to the heavenly constellations by the gods of music. As indicated above, the music is a repeat of strophe 1 (and closer to it than strophe 3 had been). As in strophe 1 with the word ‘zurück’ (and unlike strophe 3) the modulation into G major we might have expected at ‘dort begegn’ ich ihrem Blick’ is prevented at the last minute by the intrusion of a D sharp under ‘Blick’, a wrench which wonderfully suggests the frisson of the narrator locking glances with his past. We then find ourselves back in the home reaches of E major for one of Schubert’s loveliest codas. He recycles the last four lines of the final strophe and changes ‘Ach, bei ihrem milden Scheine’ to ‘Bei der Sterne mildem Scheine’. Here we encounter new musical material of the greatest simplicity and also nobility. It is in this passage about starlight that I am reminded of the steady crotchet movement of the song Abendlied unterm gestirnten Himmel which achieves sublimity using limited harmonic means as only Beethoven knew how. There is a lovely little counter-melody in the piano under ‘Bei der Sterne mildem Scheine’ the melody of which is taken up in canon by the horn as the voice continues with ‘dort vielleicht, o tröstend Glück!’. The musical effect of this is enchanting, as if one were seeing banks of stars gently twinkling in their serried ranks far into the distance. The piano writing now seems seraphic, as if having undergone a journey through purgatory it finds itself transfigured on the other side. But Schubert does not allow himself to lose the chance of an exciting ending – in fact he has it both ways: with its second-last ‘begegn’ ich ihrem Blick’ the voice remains extremely passionate (and loud) to the end of the phrase with the requirement of a ringing high B (something to satisfy the tenor Titze, this). After this high point, however, the murmurings of horn and piano suggest gentle strolls in Elysium. Water is no longer the element in which we are moving. All the material is new – meandering triplet scales, partially chromatic, with left hand answering right, and softly reverberant horn notes switching between F sharp and G sharp in a delicious contemplative glow. The idea of encountering the gaze of a loved one produces four lingering last bars which remind one – with their gently leaning apoggiaturas – of the final ‘dein Bildnis’, the words which form the coda of Schumann’s Süsser Freund from Frauenliebe und -leben; there it is a baby’s face, the mirror of the father’s, which gazes at the mother in mute adoration. In Auf dem Strom there is a meeting between loving souls in a region where speech is no longer necessary. Schubert fosters this other-worldly atmosphere by making the horn descend right down to a bottom E for its four last sonorous notes at the same time as leaving the piano chords in first inversion, and thus without a bass. We feel suspended in time and place. This is a really beautiful, but unusual, even modern, effect, somehow not of this world. Once again it confirms that in this peroration Schubert envisaged a transformation from earthly to heavenly state as having taken place. The unknown ‘ferne Geliebte’ – the distant beloved – and her impatient (and also immortal) lover are united by a composer who also felt that love was a companion unlikely to be encountered this side of the grave. Days of bliss, you are gone for ever! to linger in yonder arbour. across the grey, angry sea.